Trust me, I know how busy your life as a married couple can be. With work, family, extracurricular activities, exercise, kids, cooking, household chores and all of the other tasks we have to complete each day, it seems like there’s no time for anything else. Well, I’m here to tell you that you must make time for one more thing…fortunately, just 15 minutes each day will do the trick. That’s only 1% of the time you have available each day, so you know it’s realistic. You need to make some time each day to be a couple instead of parents, employees and whatever other roles you play each day. Your marriage is more important than your children or your career, so you need to start nourishing it. Your marriage must come second (just behind your relationship with God if you share that belief), and it cannot be allowed to slide to any less priority in your everyday life. Find just 15 minutes each day to sit without distractions and talk to your spouse about your day, your thoughts, your dreams and whatever else you feel like sharing as long as you are engaged in an intimate conversation. And please be sure that your conversation doesn’t revolve around things that need to be done around the house, the kids’ school activities or any other “responsible” meeting topics. This time is for you to talk about your individual thoughts and your desires as a couple. The first step in this fun little adventure in romance is to identify where you’ll find your 15 minutes. Well, it starts with the right perspective. What if you found out that you had to spend 15 minutes each day getting a medical treatment that you needed to survive? Less dramatically, what if you could voluntarily give this time to help your spouse achieve a great deal of happiness? Or pump up your own happiness, get rid of stress and feel fulfilled? You can find the time. After all, we are literally only talking about 1% of your day here! When we decided to make this 15 minutes of “couple time” a priority in our marriage, we simply made sure the kids were in bed at a consistent time each evening and spent our time together before we did anything else. We found that all of our other responsibilities can easily wait for a measly 15 minutes. This is our sacred time for each other and the key to staying engaged in our marriage – and we wouldn’t trade it for the world! While 15 minutes per day should do the trick, I further encourage you to schedule a date night once every week or two. It doesn’t have to be an expensive or elaborate outing. While it is preferable to get away from the house and all of the “to-do’s” it represents, you don’t necessarily even have to go out. Your date night can be as simple as cooking dinner together and sharing a bottle of wine, or just watching a movie together after the kids go to bed. The important thing is that you are engaged in your relationship and focused on appreciating each other as a couple for at least a short time each week. 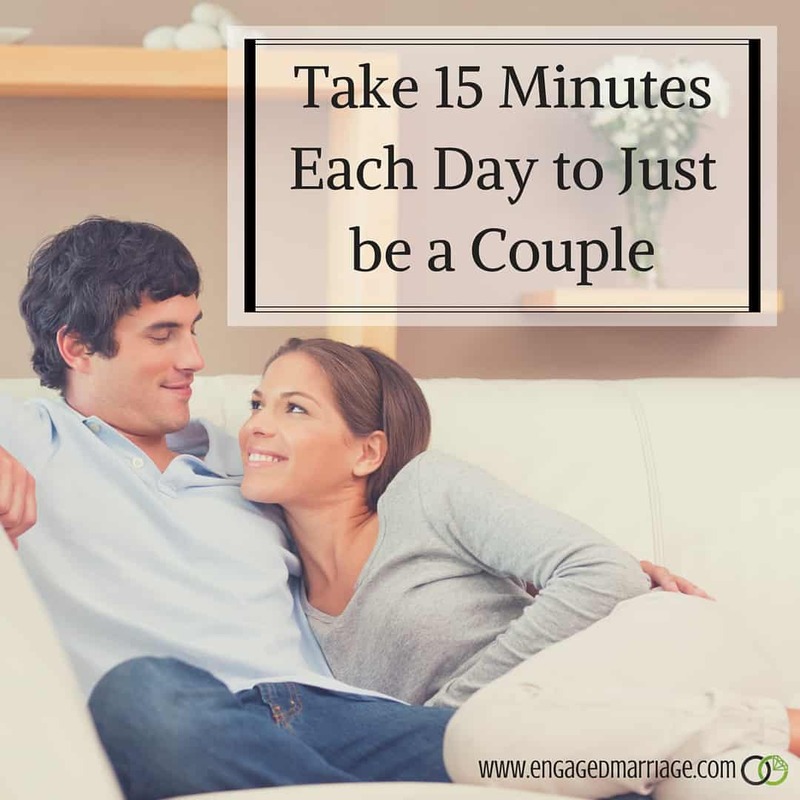 There you have it: spend a measly 15 minutes being a couple each day, and you’ll feel closer than ever. Throw in a fun date night just once per week and you will be on your way to having an awesome marriage for life. See, it’s not hard to be Romantic after all! Need Some Ideas for the Best Way to Spend Your 15 Minutes? Thanks, Jaycie! After I wrote this article, I realized that I need to practice what I preach a little closer on this topic. It is definitely easy to let the “couple time” slide with all of the busywork of life. This is funny, my husband was so relieved when I told him I only need 10 to 20 minutes of conversation time to feel like we actually have a relationship. He was thinking he needed to romance me all the time, all day…I wondered where the heck he got that silly idea. Funny. I love it, Susan! It’s funny you say that because my wife called me out on this. While we are generally pretty good about spending time together after we get the kids to bed, I have been really busy during my “free time” lately. Guess what has been occupying my time the most? You guessed it, setting up and contributing to this blog! She is very supportive of the site and the goals behind it, so it doesn’t create any real problems. However, we now have our “15 minutes” set aside each day and it is held sacred…practicing what I preach! These breakthroughs are are real sigh of relief arent they! .-= Tom and Debi Walter – TheRomanticVineyard´s last blog ..Take Your Medicine =-. I have heard this comment before on a sermon, but it so true. It’s so easy to fall of the wagon and get into a routine. Before you know it, it’s bed time! It’s hard to break away from the day, stop, and focus just on my spouse, but I know it’s very important. It’s important for my spouse and I to talk about our dreams, what makes us happy, and get to know each other just as we did as we were dating. This is an awesome post, Dustin! 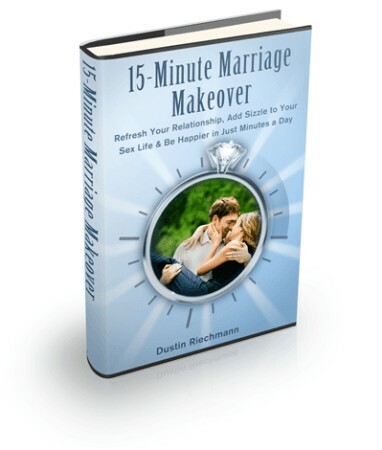 Hey Dustin, like you say, 15 minutes a day is so easy (once you change your mindset) and it’s so worth it for a marriage. For the last 5 years, this is something my wife and I have been employing along with date night every Saturday – we simply have a stand in babysitter for every Saturday. In addition to this, we also go on an annual date trip for 4 nights without the kids. At first, this seems hard to do but once you explain to the kids how important it is, they begin to understand and ease up. In addition to the 15 minutes, start dating your wife again and court her every day! I was almost divorced and now more than ever I appreciate my wife every day. It makes a world of difference. Great post you have here. Every one needs to pay attention to it for sure. This is really great advice. It’s the Slight Edge for married couples. One that is very easy to ignore in the most important relationship of all. Great article, great work! Thank you, Dustin. This was a very helpful tip. I really love reading this article. So many great tips. Couples often fail to realize the power of a kind word or simple gesture of love. Taking 5-10 mins before and after work can have a positive affect on the health of your relationships. Thanks for the great article.